August 5, 2013, Senior World Championships in Budapest Hungry at Syma Olympic Sports Hall. Senior women’s epee consisted of 154 fencers. 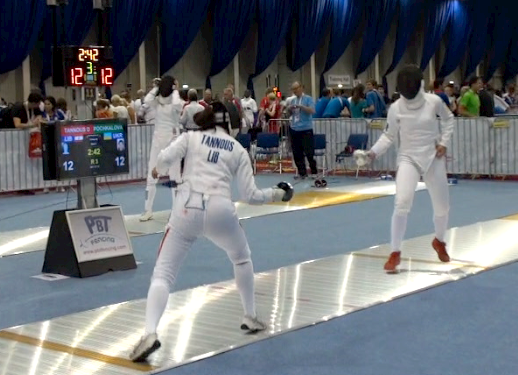 The event was formatted with 16 fencers exempt from the pools, this resulted in twenty pools. Of the twenty pools, only two pools had the mere six fencers. And Ines Hermino of Portugal 5-2 and Yuk Cheng of Hong Kong 5-2. While she lost against the brazilian Cleia Guilhon, ranked 47th in the world, 5-4. and against Bezhura from Ukraine 5-4. Dominique was qualified for the preliminary table of 64, and earned the 40th spot, she would next fence the 25th seed Anfisa Pochkalova of Ukraine. Pochkalova , a member of the London 2012 Ukraine Olympic Team, defeated Dominique who managed to tie up the match in the third period 12-12, 13-13, 14-14 and the final touché was for the Ukraine.